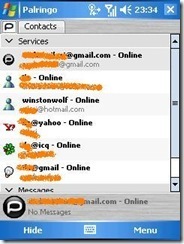 Today I read this post on LifeHacker and I decided to give Palringo a try: it's an IM app that runs on Windows Mobile - powered devices and on Symbian (but Palringo has also a desktop Windows version, and if I understand well a java mobile version is planned), and I find it really good. 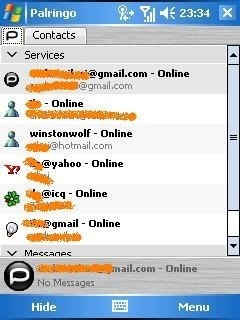 In order to work you need to register on palring's own site, and then use those credentials on your mobile device to login; then you start adding your identities on the various protocols and networks Palring knows about: Msn/Live, GTalk, ICQ, Yahoo, AIM. And its proprietary network too.